I originally released this over at PHO, then brought it to PokéCommunity too (due to several requests), and now it arrives here at Silph Co. - which will now be its home base. Hope you guys enjoy it! 5/31/2018 - Just found out that you may or may not see a random Lapras sprite in the Lilycove PKMN Center. For some reason it appears there as one of the game's dynamic sprites, and so never showed up in the map editor as a Lapras. Not sure how to fix it right now besides removing that dynamic sprite from that map, which could amount to removing whatever original feature it was intended for (don't want to do that though). 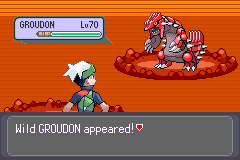 Δ Coming into Route 111's desert from the top side may result in a cactus (new tiles) appearing glitched. It's harmless and even fixes itself as soon as the map is refreshed, but I plan to address this next time the game is updated. Aside from that, I also fixed up the look of several Underwater maps that had a really ugly tile layout that I overlooked. Here are before/after pics as an example of what I'm talking about. !Δ! Even bigger bug fixed (5/15/018): So after being notified that there were problems with Mystery Gift and a couple of battle events, I went in, fixed and also play-tested every last event and now everything is finally working as it should. For those who have already done some of the post-game events, applying the new patch will just give you another shot at them since the flags and variables are different. If that's the case, have some fun exploring to see what's available again. Otherwise, there is nothing to worry about that I'm aware of. Please read the change log in the original post for details. Note: I am going to be taking a break from this project for now, it's just taken up way too much time lately. Also it has already had 3 big updates within the past few days, which is probably bordering on too much re-patching... Just didn't want you guys having to put up with sloppy errors. I'll still provide technical support if anyone needs it, and will read/respond to new messages whenever I can. Have fun everyone, I hope you enjoy this game. this looks really fun! Patching this now, do you have tips for someone who plans on nuzlocking this? Well, I haven't been too familiar with the Nuzlocke challenges but I'd just say to always make sure you have maybe 1 or two PokéBalls on you at all times since they'll be re-useable now (no need to buy a bunch at once), and to be aware that the levels of Gym Leaders and the like are a little higher than they used to be. They are still pretty defeatable as long as you bring a suitable team with you that doesn't have too many weaknesses. Be sure to make good use of the Berries for healing status problems and saving money on items. I imagine that many people overlook just how useful those can be for providing healing effects without wasting a turn in a battle. Personally, I tend to equip certain ones based on what environment I'm playing through. Otherwise, it is largely the original Emerald version, but with better graphics and so much more you can do if you wanted to. You must have a GBA emulator software on your PSP's Memory Stick, and must have Custom Firmware installed. The emulator I use is a modified version of TempGBA4PSP, which can be found by searching "phoe-nix TempGBA4PSP-mod" on Google (you can get it from its GitHub page). From my experience it is the best GBA emulator on PSP by a considerable margin and has less slowdowns. If you are new to Custom Firmware, you may want to search for guides on how to start. For reference I am running "6.61 ME-2.3" on both a PSP 1001 and a 2000, which is a setup that hasn't failed me. It's usually pretty easy and quick to get CFW working, but make sure to closely follow the instructions to install it. To play this game on a PSP, first apply the patch to a normal Emerald ROM as usual. Add it into the appropriate folder in TempGBA's (or another emulator's) folder system, and run the program from the Game menu on your PSP. You may encounter a 'bug' were the day of the week may appear off by a day in-game, which I described above in the list of bugs. I suspect it may be a hardware issue as it is not present when using VBA (unless VBA is the source of the issue and this new in-game RTC was built around it? I have no idea). Good luck! Hey everyone, another bug has just been found that is related to black-screens you may have experienced when facing Trainers that have Magikarp in their lineup. This is a significant but very easily fixable glitch. See the bugs section in the original post for details. EDIT: Looks like the issue also affects wild battles, but I expected this too. I now intend to release a fine-tuned version of CosmicEmerald within a couple of days, with this problem fixed (I've figured it out). Hopefully that will be the end of these unexpected and annoying problems. EDIT 2: The game-crashing glitch is now fixed, and game/guide release 5-24-018 (with a new feature) is out now! Enjoy, and check the change-log for details. Special thanks to Beastly12817 and uran10 for pointing out the glitch to me and giving me clues about the source. 2) Adds a little bit to the Raikou event that basically helps to warn players to save their game before going further so it won't be so bad of a surprise. 3) Fixes the new 'bone-pile' tiles in the desert so that they do not overlap the Player sprite. 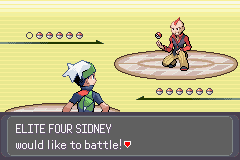 4) Gets rid of the random sprite issue in Lilycove's PKMN Center. 5) Fixes Mew's script so that it obeys after being caught, but if you already did the event then just use the patch above to bypass that problem. 6) Allows you to obtain the current iteration of the EV-IV scanning item (at the Abandoned Ship, in place of the Scanner). The script and actual feature works as intended (once you do the sidequest), but its name and appearance are a bit of a prototype right now so if it seems strange then you guys can give me some ideas if you'd like. Look for "Pokemon Emerald Mew Fix.ips"
I think there is a bug with Wattson/New mauville. 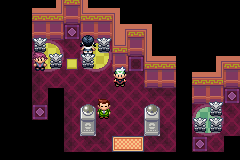 I have all the badges, but Wattson just won't show up in the intersection of route 110/118 to give me the basement key? Also, how do I reach the faraway islands? 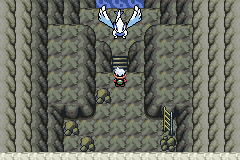 Do I have to defeat the roaming legendaries first before I can go there? Hi Nebresto, thanks for playing. Wattson's event has been changed to a post-game/higher requirement event, he will not show up until you have captured at least 150 Pokémon (Nationally). 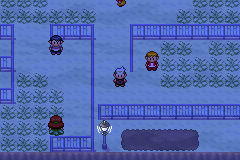 Then, he will show up in Mauville City as in the original game. You need the Old Sea Map to reach Faraway Island. For that you will need at least 180 National Dex captures. Details on acquiring it are in the original post and in the Locations Guide. Basically any Pokémon you haven't captured yet will count towards the total. Hey everyone, something I realized thanks to the user Jokeb from PC: the Surksit encounter rate is very low. 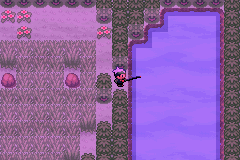 By that, I mean it is unreasonably low (1% in ponds which themselves have a 1% encounter rate). 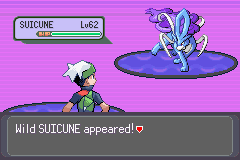 So I decided to increase the Surskit encounter rate to 4% in the next version of the game. In the original Emerald Version, Surskit is only found in "swarms" from mixing records with R/S (which can be a pain most of the time), and then is found in high quantities in grass and ponds while active. Here it is always available but is only in ponds, to keep everything balanced. EDIT: Patch has been updated to also reflect my username change and fixes the incorrect version number ingame from May-15 back to May-24 (ironically, the bug-fix patch is where it came from).